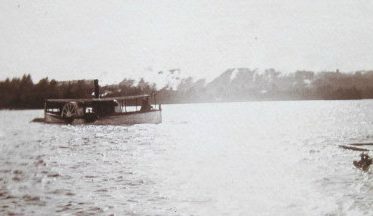 The Pennesseewassee was a side-wheel steam-powered boat that plied the waters of Norway Lake, ferrying passengers, groceries and supplies for about 25 years, beginning in the 1890s. Except for the brass whistle, the craft was designed and entirely hand-built by her captain and owner, Ed Ames. The hull was built from an oak tree felled in Norway’s Ordway Grove. The boiler was pieced together from secondhand and handmade parts, and the engine was converted from factory to marine use with handmade parts. 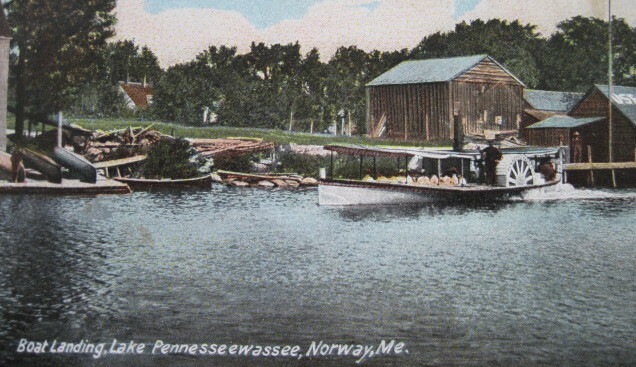 The Pennesseewassee was moored at the lake’s outlet, just north of Norway village and made two ten mile trips a day around the lake. Lakeside residents would raise a flag to signal Captain Ames that a grocery order needed to be filled or a passenger wished a ride. Groceries would be delivered on the next trip. 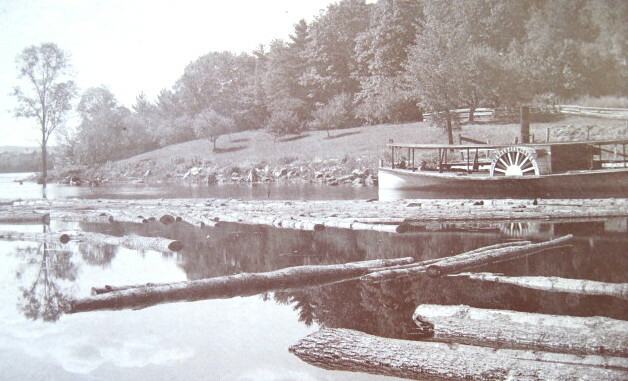 The Pennesseewassee carried youngsters to picnics at Gibson’s Grove on the northwest shore of the lake, as well as adults on moonlight cruises. Any trip on the lake required going underneath Crockett’s Bridge on the Crockett Ridge Road, which was a tight squeeze. As the bridge loomed, it was apparent to first-time passengers that the boat’s smokestack was too tall to fit under the bridge. At the last moment, Captain Ames would signal with the whistle and a crew member would pull a wire, folding the hinged smokestack down, thus clearing the bottom of the bridge. Captain Ames asked the town to build a higher bridge so his steamer would have better clearance. A high-arched bridge was built, though farmers protested that the steeper grade made it more difficult for horse and oxen teams hauling heavy loads. When commercial boat traffic on the lake ceased, Crockett’s Bridge was again rebuilt, with a level span. 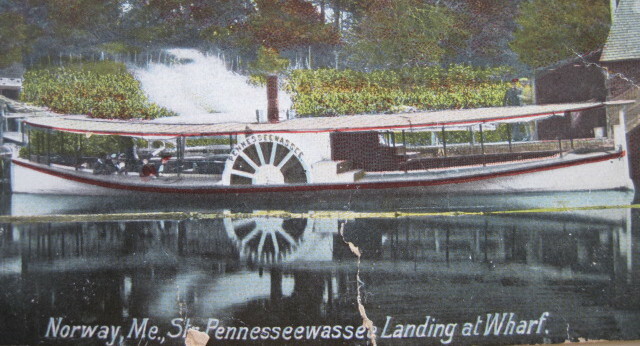 When Captain Ames died in 1902, others operated the Pennesseewassee before she was abandoned on the shore of the lake. Ultimately, the steamer was sold and dismantled.